Refined sugar can be made from sugarcane or sugar beets -- nutritionally they are identical -- but the refining process is different. Added sugars, whether from cane or beets, should be limited in your diet. The 2010 United States Department of Agriculture Dietary Guidelines for Americans states that a diet low in total fat, saturated fat and added sugars can help adults maintain a healthy body weight and reduce the risk of developing Type 2 diabetes. Refined white sugar is 100 percent sucrose. Once you have 100 percent sucrose, it does not matter whether it came from sugarcane or sugar beets. Refined sugar is a simple carbohydrate, meaning that your body can quickly convert it to glucose -- your body's preferred energy source. Each gram of sugar contains 4 calories; a teaspoon of white sugar contains about 4 grams -- or 16 calories. There is no fat, protein or fiber in sugar; nor or there any vitamins or minerals. 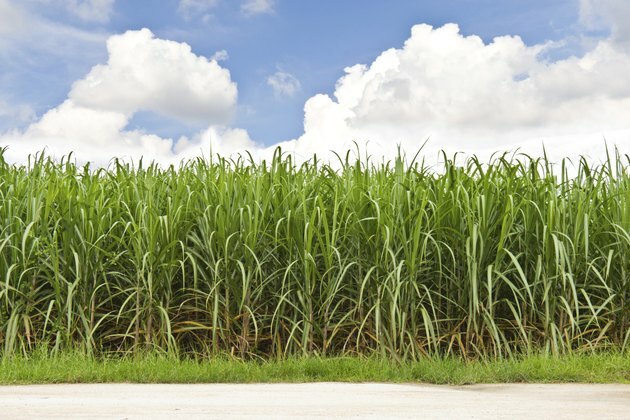 Sugarcane are large stalks that grow above ground in warm and tropical climates, according to Purdue University. The cane is harvested by burning the leaves from the stalks, then cutting the stalks down. The cane is then taken to a refinery, chopped and crushed to separate the juice from the pulp. The juice is filtered and then water is removed in an evaporator, leaving a thickened cane syrup. The syrup is heated and crystals start to form. Crystals -- which will become white table sugar -- are separated from the remaining liquid -- which will become molasses. Molasses is added back into the refined sugar to produce brown sugar. But to make white sugar, the crystals are heated one last time and then bleached with a chemical agent to make them white. Unlike sugarcane, sugar beets grow underground and are harvested and processed differently, explains Purdue University. After being removed from the ground, they are washed, sliced and then put into a diffuser. In the diffuser, water helps extract raw sugar juice; then the slices are squeezed to remove any remaining juice. Calcium hydroxide, sulfur dioxide and carbon dioxide are added to create crystals and lower the pH of the sugar juice. Then much of the chemicals are filtered out. The juice is boiled to help separate molasses, water and sugar crystals, then the crystals are dried and ready for use. Added sugars contribute to weight gain, which leads to obesity. Obesity raises your risk of a number of serious health problems including high blood pressure, diabetes, high cholesterol and cardiovascular disease. Remember that 4 grams of sugar is 1 teaspoon; when you read the nutritional facts for a 20-ounce soda that contains 65 grams of sugar, that's just over 16 teaspoons of sugar. Imagine eating 16 teaspoons of white table sugar -- 260 empty calories that don't provide any nutrients. In moderation, sugar can be part of a healthy diet, but the majority of your calories should come from complex carbohydrates -- vegetables, whole grains, fruits and legume -- lean proteins and healthy unsaturated fats, as recommended by the USDA Dietary Guidelines 2010.